Tests are boring to study for and stressful to take. But they are the key to good grades…and to effective learning (according to some studies). In this episode, Gretchen Wegner lays out four key techniques that help students get great tests grades much more often with less stress. Think Like a Teacher. Too often we assume that teachers are the ones who do the teaching, and kids are simply passive recipients. However, studying is a time when students are actually in charge of their own learning, and so it can help for students to think of study time as teaching time. It is very helpful to learn how to think actively about how learning works, the way teachers do, and the next three techniques are examples of how to do this. Study in the Manner of the Test. This may seem like a “no duh” point, but studies prove that students perform better on tests when the way they study looks exactly like the format of the test. Gretchen explains in detail how students can apply this technique to their study processes. She also refers to Quizlet as an effective tool for creating your own multiple choice tests. Make a Quizzable Study Tool. Too often students fail to think about how they can prove to themselves that they have mastered the information and skills on which they will be tested. An answer to this is to create a study tool that is formatted in such a way that they can easily test themselves. 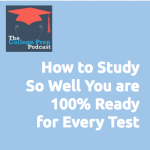 Gretchen describes several different types of study tools, and how students can use them to prove that they are ready for the test. Plan Backwards. Too often students simply start studying, flipping through text book pages and notes as a way to study. 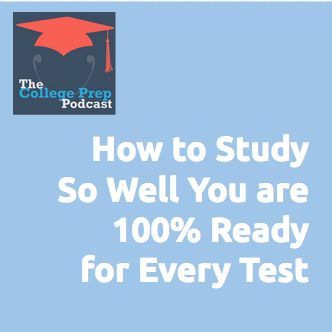 A more effective process is to work backwards, understanding what content and skills will be on the test, planning your quizzable study tool, and calendaring the specific actions you are going to take to study. Gretchen explains in more detail how to create a Backwards Plan for yourself before every test. If you’d like some personalized help about how to study in ways that work for you, feel free to check out Gretchen’s Best Semester Ever program. There is still time this semester to turn things around.